“Your brain is the most powerful and complex supercomputer ever built,” writes Jennifer Swanson. It’s about the size of a softball, weighs about three pounds, and looks like a wrinkled up sponge – but it pretty much runs this show we call our body. 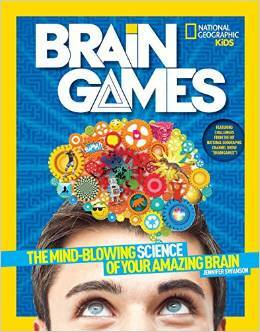 Every chapter focuses on a different aspect of the brain: how it creates memory, controls emotions, makes decisions, and solves problems. There are plenty of challenges (can you solve a Rubik’s cube?) sidebars filled with fun facts and fancy words, and cool trivia. You’ll learn about earworms – which are delightfully different from earwigs, but just as annoying – and why heart-pumping music helps you make better decisions. What happens if you smile at other people? How do they respond? For a real challenge: try smiling instead of yelling at your brother… and observe what happens to you and to him. There’s even a section for people with busy busy crammed full busy lives – about multitasking. Our brain might do better if, instead of trying to do lots of things at once, we do one thing for a short period of time and then move to a different task (sequential tasking). Jennifer’s “Rule of 20” goes like this: focus on one task for 20 minutes (set a timer). When it buzzes, take a breath, stretch your legs, then set the timer for 20 minutes and go on to a different task. Try this with your homework… your brain cells will thank you. But remember Archimedes’ Rule of 40: after 40 – 50 minutes of sitting, get up and move around for 10 minutes. Your body will thank you for that! If you’re hanging out at the Arctic you might notice a colony of Atlantic Puffins, or perhaps a celebration of polar bears. If you’re in Africa you might come across a cackle of hyenas or scare up a zeal of zebras. No matter where you are, if you come across a group of animals there’s likely a collective noun to describe them. 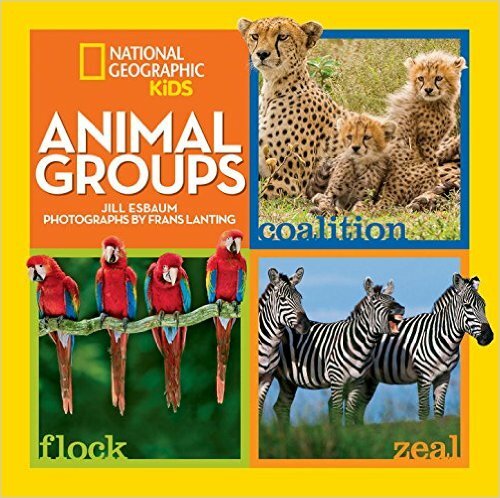 Jill Esbaum describes ten animal groups, sharing secrets of their family life. Each page features gorgeous photos plus extra facts in “Did You Know” boxes. Did you know that zebras help to keep their friends looking sharp? Back matter includes additional animal facts, a list of names of other animal groups, and a map showing where the photos were taken. This year sure has been the year for books on collective nouns for animals. Check out these other books, here and here. If YOU were in charge of making up names for groups of things, what would you call a group of puppies? A group of kittens? A group of flies? A group of kids at school? A group of books about animal groups? Over at Growing With Science blog today we have reviews of four new children’s books that feature ocean animals. Let’s take a look at two of them here. 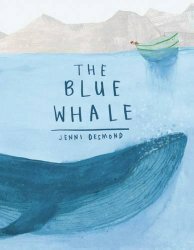 The Blue Whale by Jenni Desmond is a delightful picture book that brings in the young reader through both the whimsical illustrations and relatable information. The illustrations make this book shine. Desmond contrasts the relatively realistic forms of the whales in swimming in dark blue waters with children wearing bright colors doing fantastic things, like riding in a whale’s mouth. This is the type of book that children will want to spend time exploring every illustration and are likely to discover more with each reading. The informational text shares fascinating facts, starting with how large an adult blue whale actually is, what whales eat, and what they sound like. The tone is just right, not only giving the information, but also keeping the reader’s interest. The Blue Whale is a special picture book. Share it with a budding ocean scientist today. 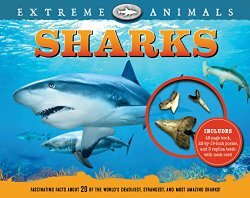 In contrast is Extreme Animals: Sharks by Ben Grossblatt, a middle grade title that is basically a beginning field guide to sharks. 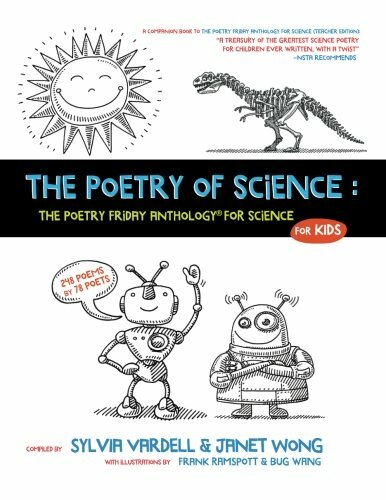 Note: Also included in the list is The Hungriest Mouth in the Sea by Peter Walters, which was previously reviewed here at STEM Friday by Sue. Categories: STEM Friday round-up | Tags: Extreme Animals: Sharks, The Blue Whale | Permalink. Noted children’s author Jim Arnosky has a new children’s picture book out, Frozen Wild: How Animals Survive in the Coldest Places on Earth. Winter might not be in full force yet, but many children have questions about what happens to animals when it gets cold out. Frozen Wild describes how animals are able to live in the cold places, including the Arctic and Antarctic regions. The first thing you notice about Frozen Wild is the gorgeous paintings, all done with a cool color palette. To fully capture the effect, many of the pages fold out into panoramic scenes. Lovely! 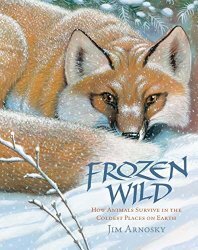 Frozen Wild: How Animals Survive in the Coldest Places on Earth is a perfect book to curl up with on a cold winter day to learn about the animals outside. Pick it up for units on animals, weather, and the seasons, as well. For the original review, see Wrapped in Foil blog. Categories: Science, STEM Friday round-up | Tags: Frozen Wild | Permalink. If you’re looking for adventure, this book opens up lots of possibilities. Tucked within the covers are photographs of some of the wildest places Carsten Peter has visited: volcanoes, caves, glaciers, and canyons. But since it’s winter, let’s explore chapter 2: Glaciers and Ice Sheets. Greenland is cold and icy – a huge ice sheet one-to-two miles thick covers most of the island. This sheet was built up over thousands of years, with snow falling on top of older layers and compressing them into layers of ice. This ice pushes outward from its thickest region, says Carsten, like cake batter spreading out as you pour it in a pan. But a lot slower. 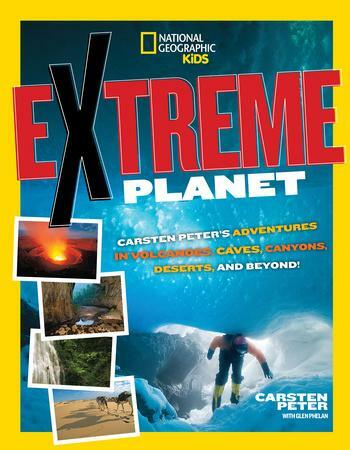 Each chapter includes current topics and science activities. In this chapter, Carsten addresses the issue of climate change and provides tips on things you can do to reduce global warming. He also includes a hands-on activity challenging readers to find fabrics that could keep them the warmest in an Arctic expedition. Carsten writes – and explores – far away places. But, he says, there’s a lot to explore right in your own community. Visit a nature center and learn about the plants and animals that live there. Learn what it was like before people settled in the area. Or settle down in your back yard and watch the wildlife that visit your part of the planet.